The past year saw the Scheme provide 8,627 hours of support to those caring for others in Caithness, an increase of 6% over the previous year. Carers continued to take up the chance of a longer break from their duties through the “Breakaway Project” and over 500 hours of overnight and weekend care was provided through the funds identified with the Scottish Executive “Carer’s Strategy”. It is unfortunate that this initiative seems to have disappeared as a future funding stream from the Highland Council. The year saw a sound financial performance generating a £3,003 surplus against an operating expenditure of £113,693 – the first time our expenditure has exceeded £100,000. Highland Council and Highland Health Board grants and Carer Strategy money provided 59% of the income with a further 8% through direct purchased care by the local Social Work Services. Care purchased privately through the Independent Living Fund accounted for 8%. The 25% balance coming from the Scheme’s own resources. The Scheme is very fortunate in the support it gets from individuals and local organisations in Caithness, who this year raised a staggering £19,000. Tudor Trust and Lloyds TSB have provided grant support for 2-3 years to the Wick Project which started in mid-2002 and is seeing a gradual increasing uptake of Crossroad carer support in Wick. The overhead costs of the Scheme are increasing due to a 170% increase in affiliation fees to Crossroads Scotland and a 200% increase in our insurance. With a likely £900 registration fee and £450 annual inspection fee for the Care Commission in 2003, coupled with the increases in National Insurance, it is taking a lot of donations and coffee mornings just to remain legal in the increasingly regulated voluntary sector. In September 2002 Highland Council and Highland Health Board started to negotiate a new Service Level Agreement which moves away from grant funding, which provides a lot of flexibility in whom we can support, to one of identified clients, at a fixed cost per hour. At the time of writing this report, the Caithness scheme, along with the other seven Crossroads Schemes in the Highlands area, have failed to reach agreement with HC and HHB, primarily due to the late advice – after the start of the 2003/2004 financial year, of the financial details. This is a very worrying development which I hope can be resolved quickly so that Crossroads Caithness can continue to provide the much needed support to our carers. I would, once again, like to thank the Management Committee for their support over the year. Without, however, the dedication, experience and training of the Coordinator and Care Attendants, there would be no Crossroads (Caithness). Directors re-elected at the 5th Annual General Meeting in 2002 (Mr Owen Pugh, Mr Keith Muir, Mrs Eileen Spearing, Mr Gavin Pope and Mrs Cathy Wratten) continued to serve throughout the year. Mrs Angela Lewis became a Director following election at the Annual General Meeting in 2002. The scheme was sorry to lose the services of Ms Gillian Godsman, Ms Katrina McNab and Mr David Flear during this year due to their heavy work commitments. 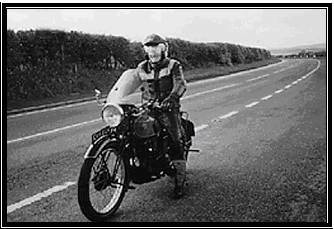 Dr Gordon Birnie, a staunch supporter and a founder member of the scheme since its inception, died early in 2003. The scheme welcomed Dr Anthony Page as a member in January 2003. Dr Page agreed to act as Medical Advisor to the scheme in February. Mrs Maggie Page continued as Care Coordinator supported by Mrs Erin Mackay as Admin Assistant until October 2002. Mrs Mackay resigned due to family commitments and Mrs Penny Mathews agreed to work on a consultancy basis to ensure statistics/payroll duties continued until a new Admin Assistant was appointed. The scheme appointed Mrs Fiona Robertson to the post in April 2003.
he company (scheme) continues to rely on a number of sources of funding to provide support to those caring for others in Caithness. Subject to a business plan, bidding process and audit. Independent Living Fund (ILF) Subject to individual care assessment. Work Services through Carers Strategy funding Subject to individual care assessment. - Grants from Charitable Trusts Subject to a well argued case put to Trustees by the scheme. This was the 5th year of operating under Service Level Agreements (SLAs) with both Highland Council Social Work Services and the Highland Health Board. The existing SLAs were extended for 2002/2003 to allow negotiation of new terms for 3 year running contracts beginning April 2003. The continuation of grant funding is dependent on the scheme demonstrating a number of performance criteria set by the HC and HHB each year. Grant funding for 2002/2003 continued at the same level as in previous years with a modest allowance for inflation. In September 2002, the HC and HHB opened discussion with the eight schemes in the Highlands area on a new form of SLA to begin in April 2003. This would move away from grant funding towards a cost per care hour more in line with purchased care but with an allowance towards meeting scheme overhead costs. Up to the year-end the format of the new SLA had been agreed in draft but SWS and HHB would not provide any advice on funding level or the expected care hours to be delivered. The scheme was asked by SWS in January 2002 to provide extra weekend/overnight care for the last three months of the financial year and was allocated £8,000 from the Carers Strategy funding – the balance of this money being carried over to this financial year. In total 788 hours of respite care at weekend and overnight were provided, 534 hours being in the period April 2002 to March 2003. In addition to the carer support provided by the annual grants from HC SWS and HHB, the scheme is invited to supply carer support over that which we can provide within our grant funding. We have supplied day care on a regular basis but there has been a decrease in hours provided to 900 hours. The scheme has also supplied 1087 respite care hours requested and purchased by the carer or the person being cared for using allowances from statutory bodies identified for that purpose eg Independent Living Fund (ILF). The total of purchased care hours has shown a small reduction compared with 2001/2002 – 1987 hours compared to 2169 hours. At present Crossroads does not charge for its carer support. However, should a carer wish to enter into a private contract with the scheme, terms can be arranged. This contract of necessity must reflect at present the full costs, ie not subsidised by statutory body funding. The scheme continued to enjoy support from the Tudor Trust, Camelot Foundation and Scottish Business Achievements Award Trust (SBAAT) to our Breakaway Project and from the SBAAT for the supply and maintenance of mobile phones for Care Attendants use in an emergency. Tudor Trust and Lloyds TSB agreed to support the “Wick Project” (see later) for 2 to 3 years and provided £12K towards the cost in 2002/2003. Donations totalling £14,058 have been received during the year which is almost double the amount received last year. 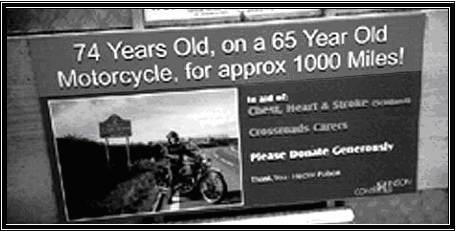 We must mention the circumnavigation of Scotland by 74 year old Mr Polson on his 65 year old motorcycle raising funds on behalf of Crossroads (Caithness) and Chest, Heart & Stroke (Scotland). He donated £2,221 to each organisation. Aberdeen and Northern Marts, Caithness, held a large barn dance, barbeque and auction at their base at Quoybrae in the autumn of 2002 and donated £4,757 to the scheme. The scheme is extremely grateful to all who have supported us in this way. All monies received are directed to providing respite care to carers in Caithness. Our Summer Coffee Morning held in Thurso Town Hall in June raised £513. Thanks are extended to all who supported us on the day either by selling tickets, baking for the stall etc or donating raffle prizes. Once again, Management Committee members and Care Attendants sold programmes for the Halkirk Highland Games which brought in £641. We have been able to hold one extra Coffee Morning this year which was held in January 2003 which brought in £301. Although on a Friday morning, it proved to be a very welcome occasion for the local ladies who had missed out on their coffee mornings since Christmas. In February our Annual Raffle was held raising over £1,150 – our thanks are once more extended to all who sold tickets, all who bought tickets and most importantly to those who donated prizes. The raffle was drawn on 22 February in the Weigh Inn in Thurso. Our thanks go to all who helped in fund raising this year and in particular those who always bake for our sales table. All events saw a grand total of £5,328 from scheme fund raising. Over the year 377 hours of BreakAway care have been given to carers and clients. This time has been used for a number of purposes. Although breakaways have in general been taken locally to enable carers to have a night out or a longer break from their caring role, we provided care for a full week to allow a carer to visit Edinburgh to see his son and new grandchild. On two occasions at the weekend we have cared for a teenager so that the family could have time to spend on their own. One carer asked for our assistance to provide cover so that he could organise a surprise Birthday Party for his wife and to allow them to spend the evening together, and another Breakaway allowed a couple time to collect a new horse and also time to visit friends away from Caithness. The “Breakaway Project” which was launched in 1998 has almost exhausted funding provided by Tudor Trust, Camelot Foundation and the Scottish Business Achievements Awards Trust. It is unlikely that this much appreciated longer break will be funded by the SWS or HHB and further appeals will be made to major Charitable Trusts in the coming year to enable this project to continue. Each care attendant continues to be provided with a mobile phone for use in emergency situations, such as bad weather, vehicle breakdown etc. In the last 12 months 5 handsets have had to be replaced due to failure of the batteries, which could not be replaced due to no longer being manufactured. This project continues to be funded by SBAAT at the present time. Funding for a new office to be set up in Wick on a one year sub lease from Caithness Deaf Care together with the installation of the telephone line and a computer so that the Coordinator can continue to work when away from the company office was obtained from Tudor Trust for a 2 year period and Lloyds TSB for 3 years. The Wick office which became operational in June 2002 opening two ½ days a week, is now manned for two full days/week by the Coordinator. The establishment of this office has seen an increase in the number of referrals to the scheme. Once again it is the carer who usually makes contact. Difficulty is being experienced however in recruiting and retaining Care Attendants to work on the Wick side of the county. The aim of the scheme continues to be to provide a high quality, flexible, domiciliary respite care service to carers, delivered by a well-trained and dedicated work force. The service offered by the scheme is led by the needs of the carers and clients, but is limited by the amount of funds available. A formal assessment system is used in cases where it is necessary to accord priority for care due to resource limitations. Any person, practice or organisation who wishes to refer a Carer to the scheme for respite care, should contact the Co-ordinator (Mrs Maggie Page). The scheme currently employs 19 Care Attendants. Over the past 12 months 5 Care Attendants resigned and the scheme has recruited a further 5. Following receipt of funding for the provision of an office in Wick, a need for additional admin assistance in Thurso was identified to allow the Coordinator to work from the Wick office two days a week. The admin assistance hours will rise from 8 to 12 hours per week as from April 2003. The Admin Assistant now covers all bill paying and banking, donations (letters of thanks/receipts), photocopying, filing, timesheet entering, statistics for SWS and Crossroads (Scotland). As part of a regular training/supervisory function, care attendants meet with the Coordinator on a regular basis. Care Attendants also maintain contact with the Coordinator by telephone and by visiting either the Wick or Thurso office. A total of 185 hours were devoted to care attendant training and meetings against 183 hours in 22001/2002. The co-ordinator conducted new Care Attendants induction, Food Hygiene and Moving and Handling courses. Management Committee representatives met with Care Attendants (but without the Coordinator) during the year. Points raised by the Care Attendants were taken on board by the Management Committee. The Co-ordinators of the 8 Highland Crossroads Schemes now meet quarterly and are joined by the Chairpersons twice a year to discuss experiences and innovations in carer support. The co-ordinator continues to attend client case conference meetings when invited by the Social Work Services or Health Services. Of the 41 new referrals supported by the scheme, 9 referrals were made by SWS (an increase of 2 from the previous year). Referral by carers themselves amounted to 15. Referrals from Health Services dropped from 11 to 10 this year. At the beginning of the year the scheme had 72 carer/clients and ended with 71 clients on the books. Of these 71 client/carers, 48 receive regular respite care hours, 21 on a flexible basis and 2 are not receiving care at the present time. At 31 March 2003, we have no waiting list. We currently support 8 people who are living on their own with no carer in the area and a further 7 who have carers living locally. During the year, 39 cares were discontinued. Total respite care hours provided by Care Attendants was 8627 hours against 8133 hours in 2001/02 – an increase of 6%. Mainstream hours totalled 3719 hours against 3493 hours provided in the previous year [6% increase]. Dementia hours totalled 2010 against 1779 last year [13% increase]. Social Work Services purchased 900 hours and individuals purchased 1087 hours through Independent Living Fund arrangements. Carers Strategy funding provided 534 hours of weekend and/or overnight support to carers. 377 hours were provided through the Breakaway Project. Care Attendants Training amounted to 185 hours. Care Attendants drove 49,129 miles in providing care in 2002/2003 – a 15% increase on the previous year. The Co-ordinator worked a total of 1808 hours, her Deputy 330 hours and the scheme financed admin assistance of 472 hours – 2610 hours in total compared to 2175 hours in the previous year. The Co-ordinator and her Deputy travelled 5641 miles compared to 3083 miles in 2001/02. We thank Mr Sinclair and Mr Busby of Victor T Fraser and Company, Chartered Accountants, for their swift action IN PRODUCING THE audited Accounts for the year. The SLA direct grant from Highland Council (SWS) was for £44,316 a 2% inflation increase over 2001/02. The Highland Health Board SLA grant was £15,292. The total grant income was £59,608. In October a review of staff wages/salaries saw a stepped increase in Coordinator salary over an 18 month period and a rise in the hourly rate paid to Care Attendants. The scheme considered this was absolutely vital to maintain our standards of care provided by our care attendants and to achieve parity with SWS Home Carers. The Highland Council SWS Purchased Care SLA care hour rate was increased from £7.42/hr to £8.40/hr in April 2002 with no change in the transport mileage rate of 27.8p/mile after the first 4 miles. Care purchased by SWS and individuals through ILF amounted to £18,779. 25% of our income was provided by our tireless fundraisers and from generous donations (£19,386). Transfers from the restricted funds identified with the Wick Project contributed £9,000. The total income of £116,906 is to be compared with £98,380 in 2001/2002. The care attendant wages and travel costs accounted for £75,954. Scheme coordination and management accounted for £26,3832. Office costs – rent heat, stationery, light, postage, telephone etc with fund raising expenses, insurance, affiliation fees, audit, etc, accounted for £11,356. Scheme expenditure at £113,693 is the highest ever and is to be compared with £93,830 in 2001/2002. Scheme expenditure at £113,693 leaves a surplus for the year of £3,003 which is transferred to the scheme reserves. If all expenditure is set against the number of respite hours provided this year (8627) this gives a cost per care hour of £13.18. If scheme coordination and office overheads are set against grant income from HC & HHB, then the cost per care hour is £8.80. The average cost of providing purchased care on behalf of Social Work Services and ILF clients is £9.45 assuming again all co-ordination and office costs are set against the grants. Overall a satisfactory year, yielding a small surplus with our unrestricted reserves standing at £31,638. Restricted reserves identified with the excluding Wick Project stand at £4757. The reserves are necessary to cover any staff redundancies in the event of having to close the scheme (hopefully, a very unlikely event) and also to cover 6 months operating expenditure in accordance with good company practice and to accommodate any late payment of grant money. The scheme’s major concern at the close of the financial year is having no Service Level Agreement (SLA) with our major funders – HC and HHB for 2003/2004 et seq despite discussion since September 2002. The SLA exists as a draft document but with no indication of the level of funding for future years and an anticipated change in method of attributing funds to care delivery.